Apologies, for I'll be a bit slack with posts this month and quite possibly the next too. December and January are traditionally very busy times of the year at the company where I work - no annual leave is to be taken these several weeks, and I've been working late quite often, which means not having much time to do a lot of cooking. I have to say though, I'm a lucky girl because my parents are here visiting from Malaysia and they have been good company and so fantastic and understanding. Not only that, but they've been adding a cosy domestic touch to my apartment, and in the evenings I often arrive home to a lovely dinner waiting for me. So here, I want to share with you a few of the highlights from the past two weeks. This seafood dish had generous lashings of fish, prawns, and asian greens with a mix of somen and soba noodles. Pretty luxurious for something that was just hurriedly thrown together at a whim! 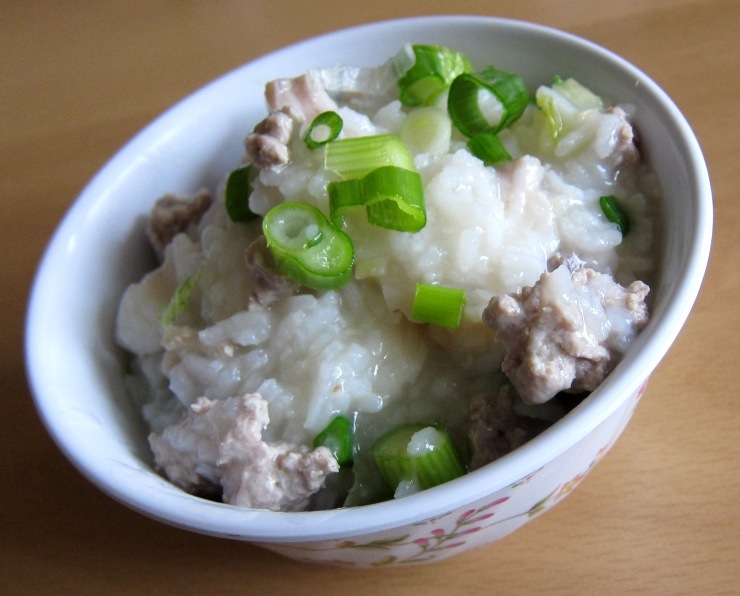 This is a simple minced pork congee with a sprinkling of spring onions on top. 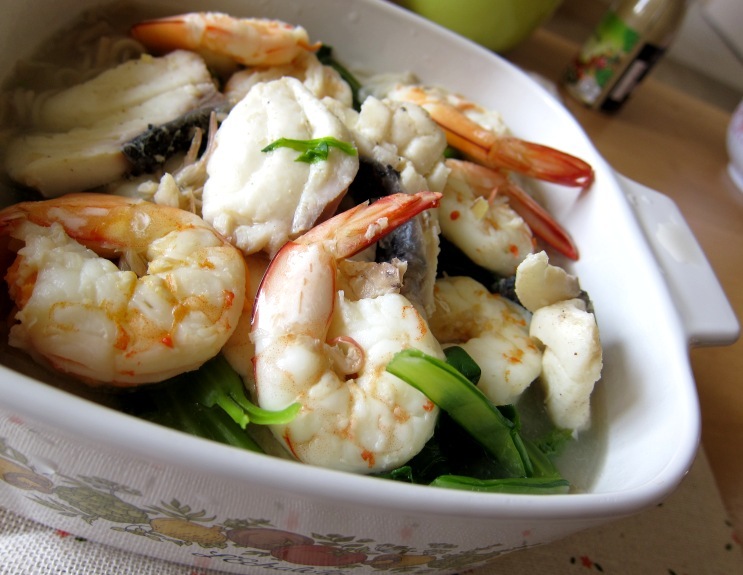 My mum makes a distinctive style of congee - thick and gooey, instead of the usual delicate and watery ones. It's incredibly comforting, and I adore it. And of course, the infamous bak kut teh. 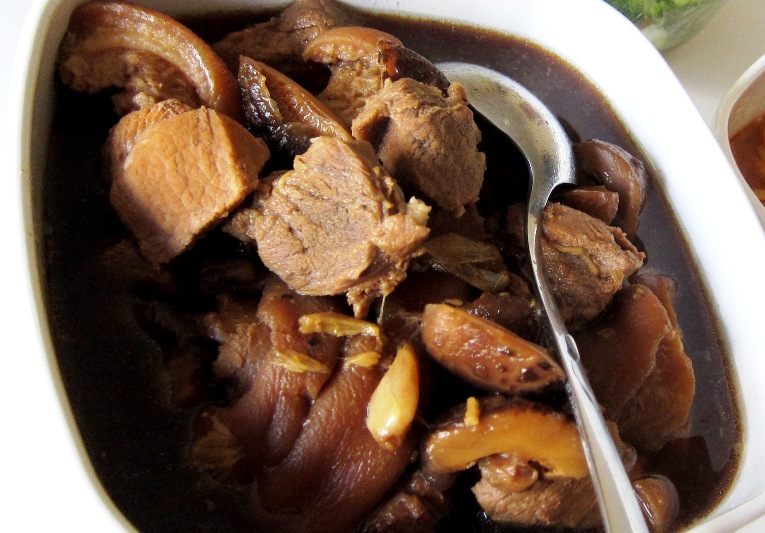 I grew up in Klang, after all, which is well-known for this rich-tasting herbal pork soup. This one was made with the help of pre-mixed spices, but it's good quality stuff and of course personal touches are added. Plus, the pork was carefully selected and prepared. Needless to say, pork leg made an appearance. You want some skin and fat in this dish - they're the best. Look at all that glistening, gelatinous goodness! That's all for now but there will be plenty more where this came from, because my parents are pretty awesome. I hope everyone is having a good December so far, and coping well with any of the madness that comes with the silly season! I wish my parents cooked the way yours do. My grandmother, who was a fabulous Italian cook never shared any recipes or taught my mom how to cook. I'm hoping to revive the cooking tradition. I've never tried congee........but read so much about it. The bowl of prawns look lovely too. Enjoy your time with your parents. They look a lot different to my mum's home cooked meals but I'm sure just as comforting. I'm back at the family home on Thursday for some spoiling. There is nothing better than a great meal cooked by mum. So comforting and with love. Yay! My parents are over at the moment too and I'm loving it as well. It's like a holiday for me because they do the shopping, cooking, cleaning, laundry.... Hope work isn't too hectic for you! Melissa, I think your blog is a great start to reviving the cooking tradition in your family! Shu shu, I hope you enjoy the upcoming spoiling! Wow - if you get to eat like that when the parents are in town, I suppose it must be some solace for the fact that you can't cook as much! Geez, that looks great.